Arshak II (Armenian: Արշակ Բ, flourished 4th century, died 369 or 370), also known as Arsaces II and Arsak II was a Prince who served as a Roman Client King of Arsacid Armenia from 350 until 368. Arshak II was the second born son to Tiran (Tigranes VII) by an unnamed mother. His father served as Roman Client King of Arsacid Armenia from 339 until 350. His date of birth is unknown and little is known on his early life. Sometime during his father’s reign, the Sassanid King Shapur II launched a war on Rome and her allies, firstly by persecuting the Christians that lived in Persia and Mesopotamia. Shapur II’s war by capturing these territories began to deal a severe blow to Roman prestige in the East. Sometime into his father’s reign, Shapur II with his army had invaded Armenia; eventually taking Arshak II with members of his family as hostages as they were betrayed to Shapur II by his father’s chamberlain. Arshak II along with members of his family had become Sassanid political prisoners in which his father was blinded and thrown into prison after Shapur II accused his father of collusion with Rome. The nobles of Armenia were infuriated by the brutality of Shapur II and his treatment of Arshak II with members of his family, took up arms and fought against Shapur II and his army with assistance from the Romans. They successfully drove Shapur II and his army out from Armenia. After Shapur II was defeated, he had signed a treaty and Arshak II with members of his family were released from prison. As Arshak II’s father being depressed and blinded from his experience in captivity, had abdicated his throne and Arshak II succeeded their father as Armenian King in 350. Arshak II like his father, strongly pursued a policy on Christian Arianism. 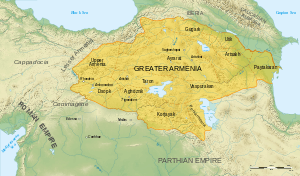 In the early years of his reign, Arshak II found himself courted by the Roman Empire and Sassanid Empire, both of which hoped to win Armenia to their side in the ongoing conflicts between them. By 358, Arshak II had married a Greek noblewoman Olympias the daughter of the late consul Flavius Ablabius which through this marriage Armenia was able to remain neutral to Rome and remain an ally to her. According to the Historian Ammianus Marcellinus (XXV. vii, 9-13; vol. II, pp. 532/3-534/5), describes Arshak II as ‘steadfast and faithful friend’ to the Romans. The King of Sassanid Persia Shapur II, intensified his efforts to conquer Armenia once and for all. He was able to bribe two Armenian noblemen Vahan Mamikonian and Meruzhan Artsruni and make them join his royal court. Arshak II focused on strengthening the army. He rewarded loyal generals and severely punished disloyal ones. He crafted an ambitious plan in which all criminals that settled in his newly founded city, Arshakavan, were given complete amnesty. Approximately 150,000 individuals were settled in the city. His hope was to create a large army directly under his command but, many in the Armenian nobility did not agree with the plan and subsequently destroyed the city and killed the inhabitants. The Romans and the Persians were involved in conflict again. Roman Emperor Jovian, being in a very difficult position, negotiated an undesirable peace with Shapur II in which he allowed the Persians to take over the fortresses of Nisbis, Castra Maurorum, and Singara along with a part of Armenia. Arshak II found himself abandoned by the Romans and left to defend Armenia all alone. The Persians swiftly attacked but were unsuccessful, partly due to the leadership of the general (Armenian: sparapet) Vasak Mamikonian. Shapur II, seeing that brute force was not going to subjugate Arshak II, he turned to treachery. Arshak II was invited by the Persian King for peace talks. When Arshak II arrived with Vasak Mamikonian, he was taken prisoner and his general was skinned. Living in a Persian prison, Arshak II was unable to stop the Sassanid invasion of Armenia. Shapur II had conquered Armenia in which he tried to convert Christian Armenians to Zoroastrianism, the main religion of the Sassanid Empire. Sometime 369 or 370, an Armenian by the name of Drastamat visits the imprisoned Arshak II. During his visit to Arshak II, the King was reminiscing on his glory days and feeling depressed, he took his visitor’s knife and killed himself. Drastamat, moved by what he had just witnessed, took the knife from Arshak II’s chest and stabbed himself as well. Arshak II was named in honor of his Parthian, Pontian and Armenian ancestors who ruled with this name as King, in particular he was named in honor of Arshak I, also known as Arsaces I, the founder of the Arsacid Parthian dynasty and the first ruler of the Parthian Empire. To Arshak, king of earth and sea, whose person and image are as those of our gods, whose fortune and destiny are superior to those of all kings, and whose amplitude of mind is as that of the sky above the earth, from Vagharshak your younger brother. According to the Armenian Historian of the 5th century, Faustus of Byzantium in his writings History of the Armenians (Book IV, Chapter 15), states Pharantzem in describing Arshak II as, “physically, he is hairy, and his color is dark”. Arshak II appeared to have three known wives. Papas (Pap). He was born in 360 and is the only known child born to Arshak II during his Armenian Kingship.